Congratulations to our newest Hoover Award winner! During a recent CNPS Board meeting in Sacramento, I participated in a discussion on environmental justice. A quick search in Google defines environmental justice as “the fair treatment and meaningful involvement of all people regardless of race, color, national origin, or income with respect to the development, implementation, and enforcement of environmental laws, regulations, and policies.” Environmental justice addresses the phenomenon of poor communities being habitually situated in neglected, if not polluted environments, where access to clean air and water is often difficult. If we look around the state, we find underserved communities often lack modern infrastructure, access to utilities and internet, and sanitary conditions. There is also a dearth of information about healthcare, diet, and exercise. The fact is that low income communities have become marginalized because they have been denied the basic rights of clean air and water, community parks, open spaces, and educational resources. Personally, I think the strong connection between the native plant movement and the environmental justice movement is clear. A clean, pure, natural environment is everybody’s birthright, and a clean, pure, native plant environment is the essential ingredient for that to take place. As native plant lovers, we see the connection between a healthy environment and a healthy human existence; we see the relationship between clean, natural resources and quality of life. 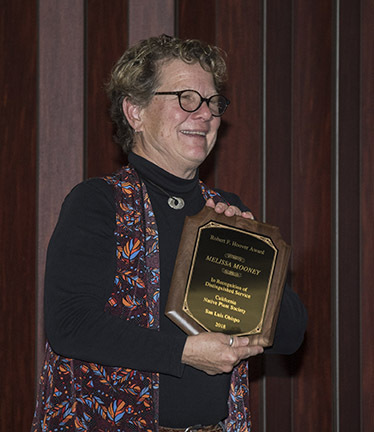 The work done by CNPS in native plant research and protection is known throughout the world for its environmental advocacy and conservation. During the Board meeting, we talked about some simple approaches to being more “present” in the environmental justice conversation. 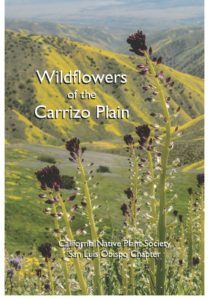 CNPS’s commitment to maintaining plant diversity in this state (over 6,000 species of plants, a third of which are endemic), is a natural segue into a discussion about the diversity of the human family in California. We acknowledge that all species have intrinsic value and need to be secured. We give equal regard to poppies, redwoods, and bryophytes. If environmental priorities are to manifest going forward, we need everybody at the table. We need the soccer moms, the plumbers, and the farm workers to join the biologists and the philanthropists, if there is to be equitable consensus on these issues. We need to listen to this conversation and participate in its discussion. We need to acknowledge this diversity and articulate its benefits. Awareness of these issues needs to spread across all communities, so there is real agreement on environmental integrity and fairness for all. After several years of dryness, we are finally blessed with a cold and wet winter. With all this rain it’s important to go over a checklist for the Spring profusion of plant growth. Seeing flowers already showing on Salvia, Ceanothus, Manzanitas, and Mahonias, at this time, it’s important NOT to prune your native shrubs. Pruning now would only remove the new flower buds and destroy an important source of nectar for the bees, birds, insects and animals. Second on the list is do not use pesticides unless you have a severe insect infestation. Spraying would produce a situation thatwould put bees and other good insects at risk. Now is the time to release beneficial insects into the garden. Most nurseries start to receive these insects, such as ladybugs, at this time of year. Third, stake trees and remove broken branches. The heavy winds are great for removing dead branches from oaks and pine trees but they can also damage young trees and shrubs. While staking, take time to inspect the root zone to make sure not to drive a stake into a main root, this would only defeat the purpose of the staking. Next, remove the largest weeds growing closet to the trunks of tree and shrubs. Don’t use Round-Up™. Large weeds can be pulled and composted. For smaller weeds, spray with straight vinegar. This will burn the small weeds and will not affect the soil. There are also several new organic based weed sprays mostly made from peppermint oil. Last, do not rototill close to tree and shrub trunks. This weed control method works great but can cause serious damage to surface roots. Lastly, get your favorite chair and beverage ready so you can relax and enjoy your beautiful garden and the flowers to come! Until next month, Happy Gardening; John Nowak, Plant Sale co-Chairperson. A few years ago, I became interested in lichens and bryophytes during the winter months when there were few flowers to look for. I took a class on lichen ID up at U.C. Berkeley’s Jepson herbarium, and then another at the Santa Barbara botanic garden. I highly recommend these classes for anyone wanting to learn more about lichens. Most lichens have algae as a photosynthesizing component, others use a cyanobacteria in addition to its fungal component. CNPS has helped protect rare lichens as ranked plants, so I’m including them this month in Ethnobotany Notes. People around the world use lichens for food, medicine, dying wool, and a variety of other uses. I have read that Native American people in the Pacific Northwest had traditionally eaten a type of Bryoria lichen, which was boiled or pit roasted in a special way to reduce the toxicity from the secondary compounds. I’ve also heard of friends who made an antibiotic salve from our local Usnea. Usnic acid has long been a part of commercial herbal deodorants and skin creams. There are reports that it was used for baby diapers as well. It is estimated that 50% of all lichen species have antibiotic properties. Some lichens were used for poison, especially those high in vulpinic acid which tends to make a very yellow lichen. Lichens were also used in ancient Egypt as part of the embalming process. Lichens are a common source of natural dyes. Indigenous people in North America made a yellow dye from the Wolf Lichen, Letharia vulpina of the Sierras by boiling it in water. Some dyes can be extracted with boiling water, but others require ammonia fermentation, which is steeping the lichen in ammonia (traditionally urine) for at least two to three weeks. 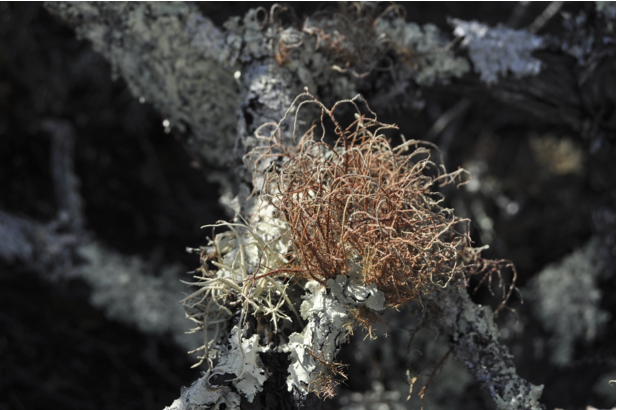 In the Scottish highlands, various lichens yielded red, orange, brown, and yellow dyes. In Europe, a purple was extracted from Roccella and Ochrolechia. Litmus, the pH indicator is extracted from the Roccella lichen. Ethnolichenology has quite a Wikipedia page. I was surprised. It is well worth looking up, if only for the 19th century Japanese painting of Umbilicaria lichen gathering. If this has whetted your appetite for lichens, you can find lichen walks and workshop information at the California Lichen Society (CALS) website: californialichens.org. Sylvia Sharnoff has also written about lichens and people. 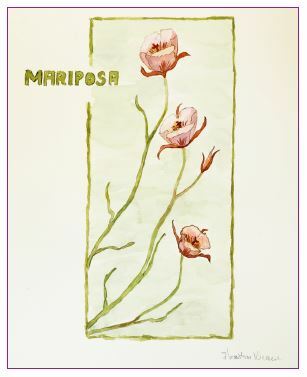 The native plant on the cover of this Obispoensis is a beautiful rendition of a species of the genus Calochortus. The painting is another of Heather Johnson’s. If you’re seeing it on the mailed version it will be in shades of gray. You can see the painting in the original spectacular color if you go to the Chapter website (cnpsslo.org). Heather identified the painting only as ‘mariposa’ and I’m not going to try to identify it to species. It often requires characters that are not present in the art work such as whether the fruit is pointed up or down. Besides, it’s the genus that’s discussed below. Calochortus is a large genus (70 species) spread over the western third of the United States. The genus’ range extends north into Western Canada and south into Central America. That said, California has nearly half (27) of the species. 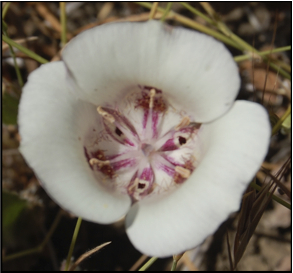 Many of the California species are endemic, such as our own Chapter flower, the Obispo star tulip (Calochortus obispoensis). If you note that the species name (obispoensis) is the same as the name of our newsletter, it’s not a coincidence. Alice Meyer (our very first Hoover Award Winner) thought the species name of our endemic star tulip (found on local serpentine, i.e. Cuesta Ridge) was indicative of our Chapter area. Calochortus is a genus in the lily family (Liliaceae). This large family of monocots is generally easy to recognize by its large showy flowers that often consists of three large showy petals and three usually colored sepals that often can be as large and as showy as the petals. Think lilies and/or tulips. 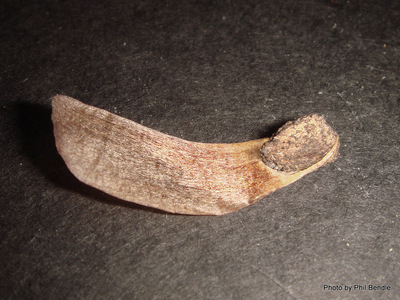 However, that is not the case in this genus as their sepals are small. Like a lot of monocots Calochortus has 6 stamens and a single pistil that matures into a capsule. The genus takes these basic elements and produces at least three very distinctive flower shapes, which, in our area match the three common names most associated with this genus. A 1998 evolutionary study (T.B. Patterson) of the genus determined that there were 4 evolutionary lines within the genus. Two of these lines correspond closely to two of the common names. These are mariposa lilies and fairy lanterns. In the fairy lanterns orglobe lilies, the flowers are nodding and the broad petals come together at their tips to form a hollow globe-like structure. Petal colors are usually subdued and lacking in conspicuous spotting. Fairy lanterns tend to be found in oak woodlands or closed woodlands. In contrast, the mariposa lilies produce upright flowers with the petal tips spread apart so as to form a cup. The individual petals are usually ornamented with conspicuous markings. The markings make obvious a large, colored (nectary?) gland that usually occupies the base of each petal. 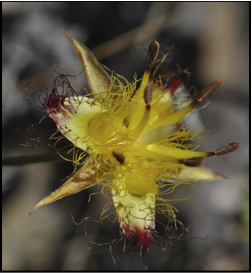 This flower form is very widespread and I’ve seen it in the Sierras and the Great Basin. Flowers are usually arranged as seen in Heather’s painting. Obviously, Heather’s painting is of a species that would belong to this group. Star-tulips make up the third flower form. 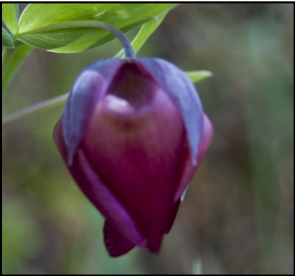 This group usually produces less showy flowers with petals that are triangular in shape and of darker colors. In addition, the petal color is often difficult to see due it being hidden by the tufts of trichomes (hairs) that cover the upper surface. The petals are flat and all in the same plain. The flowers are usually orientated vertically so the petals resemble a 3-pointed star. Our Obispo star-tulip belongs to this group. Star tulips are often found in Chaparral or mountain woodlands. For the record, there is some confusion in my mind in the application of the common names –star-tulip and the cat’s ear mariposas. The last evolutionary line is titled the cats ear mariposas. I’m not familiar with this name and when I tried to google it I got lots of remedies for curing problems with real cats ears. 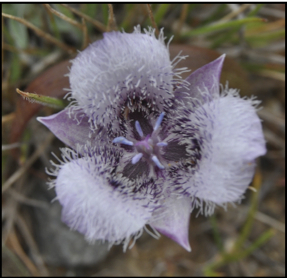 However, the species I know that were said to belong to this group had the mariposa lily flower configuration. The web noted that cat’s ear mariposas are associated with wet lands. According to the web many of the Calochortus species were used by Native Americans for food (especially their bulbs), medicine and ceremony. One source noted that the bulbs were eaten by the Mormon settlers between 1853 and 1858 when famine threatened the new immigrants to the Great Salt Lake Valley, due to crop failures. I suspect many of the species in this genus would make excellent additions to any native plant garden, especially one that lies dormant and un-watered throughout the summer drought. The problem would be getting material to plant as few nurseries keep them in stock. fall seed exchange. In preparation for collecting seeds later in the year, I have been checking out the CNPS-SLO website. An explanation of why native plants are important with links to more information. Beautiful illustrations and photos accompanied by detailed information about specific featured plants. 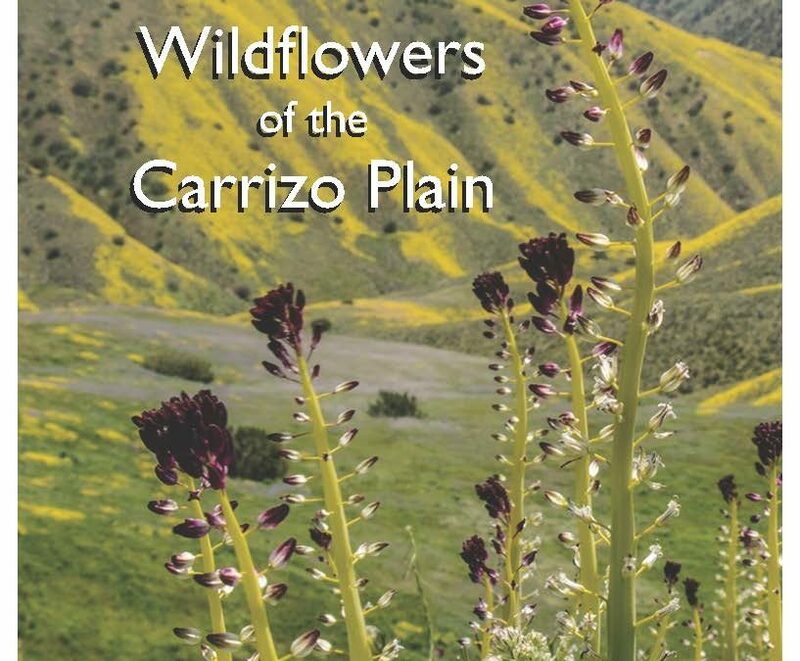 Native California Plants by Dara Emery, check out June’s book sales table at the next meeting. Now we have our own case of Dudleya smugglers caught stealing the native succulents from the cliffs in Big Sur. Read about that story here. In both these instances, a concerned observer noticed odd behavior and acted on it. Customs was called to check the shipments from the Post Office, and the woman observing the poachers in Big Sur took photos of the smugglers and their license plate. If you see something, say something. John Chesnut has created a beautiful article on propagating Dudleya – you can read it here. 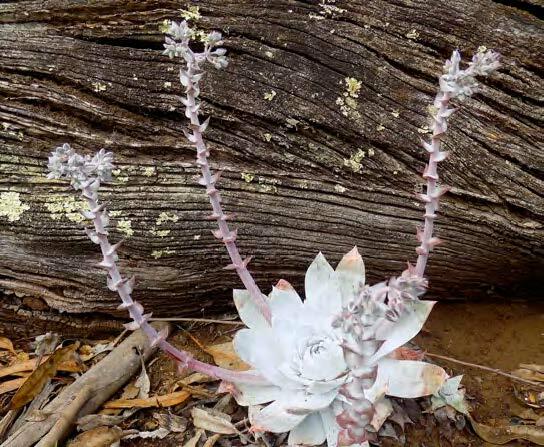 And if you are out and about and see someone stuffing plants in to a bag or prying Dudleya’s off a cliff, contact local law enforcement or CDFW. Our local office doesn’t have a phone number, but you can send an email to AskMarine@wildlife.ca.gov. February is pruning month and with all the rain its time to get out the pruning tools. A dull, unsharpened tool can be dangerous to use so it is wise to sharpen them before use. Some general rules about sharpening tools. First, always wear gloves when sharpening tools. Most of us remember the old sharpening stone used to sharpen steel tools and implements through grinding and honing. My father had a hand driven sharpener and I love to sharpen tools so as to watch all the sparks fly. This type of sharpener has now been replaced with electric motors, but the idea is the same. Electric sharpeners are only to be used for sharpening lawn mower blades, shovels, hoes, and hand held hedge clippers. Again wear gloves and eye protection when sharpening tools. Never use electric sharpeners to sharpen hand pruners – it’s not safe. So, how does one safely sharpen hand pruners? There are a few new hand-held sharpeners on the market now. One is a small hand held sharpener that has two sharpening blades and has a hand guard. This is a very safe type of sharpener and is available at most garden centers. The second small sharpener is the old 8-inch long sharpening or whetstone. This type of stone requires some motor oil to allow blade-to-stone contact. 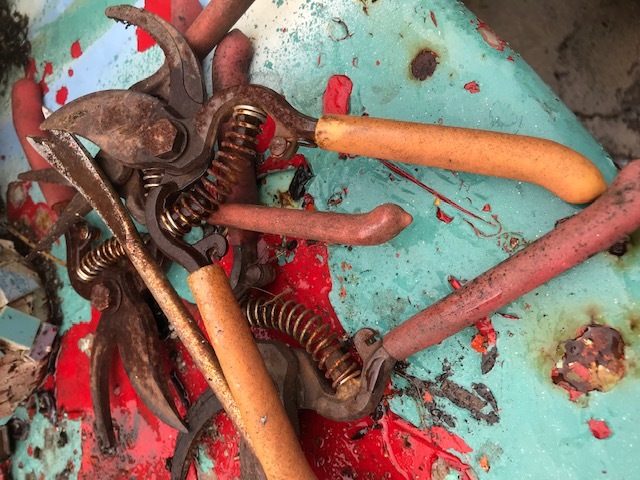 This is the best way to sharpen hand pruners and branch loppers. There are many YouTube videos on how to use a sharpening stone or whetstone and I would suggest investigating them to hone your sharpening skills. If anyone needs some extra advice on pruning techniques or what to prune, please contact me at gritlys@gmail.com. Until next month, Happy Gardening! As we have just experienced an intense and prolonged drought, a team of scientists has just published in Nature Climate Change Letters an analysis of impacts in the Carrizo Plain. They quantified the responses of 423 species of plants, arthropods, birds, reptiles and mammals to California’s drought of 2012–2015—the driest period in the past 1,200 years for this global biodiversity hotspot. The article by Prugh and others was published in Nature Climate Change Letters “Ecological winners and losers of extreme drought in California” August 20th, 2018 The report states that plants were most responsive to one-year water deficits, whereas vertebrates responded to longer-term deficits, and extended drought had the greatest impact on carnivorous animals. Perhaps surprisingly, locally rare species were more likely to increase in numbers and abundant species were more likely to decline in response to drought, and this effect was remarkably consistent across taxa and drought durations. Of the mammals, California ground squirrel, San Joaquin kit fox and Giant kangaroo rat fared badly, while Southern grasshopper mouse and Short-nosed kangaroo rat were successful. For birds, barn owls and western meadowlarks declined, while killdeer and roadrunner populations remained stable. The rare Blunt-nosed leopard lizard suffered, but the coast horned lizard and side-blotched lizard were little affected. Spiders and scorpions declined, but certain beetles did well. As was obvious to most people, nearly all plants were impacted, but certain hardy species such as Calandrinia were successful in the absence of competition. The study concludes that while extreme droughts can produce substantial short-term declines in the abundance and diversity of species, these disturbances may play a vital role in the long-term maintenance of biodiversity by inducing periodic die-offs of dominant species and subsequent opportunities for rare, yet fast-growing, species. This study is especially useful as climate change projections indicate that extreme, extended droughts will become more common, as well as the maximum summer temperature, and the duration, intensity and timing of the rainy season. larger animals and, in an inner fence, rodents from the grasslands, but I don’t know of any broad vegetation assessments apart from the CNPS-generated vegetation map which was a snapshot of conditions, and is governed by the dominant plants rather that the complete population. I would propose that this spring, we get together a group to select a series of areas that will be linked to GPS coordinates, and that the sites would be revisited and photographed (and possibly inventoried) a couple of times per year, and over many years. I am intending to meet with faculty at Cal Poly to see if they would see a way to direct a series of student projects in a similar effort. A pair of wildflower books that ship together for one low price. Second edition, edited by David J. Keil, Ph.D. 8.5 x 5.5 inches. 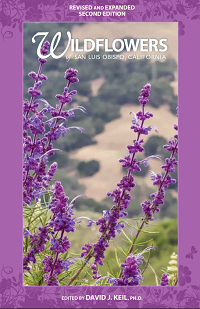 City of San Luis Obispo and San Luis Obispo chapter of the California Native Plant Society. Fourteen pages, printed on heavy card stock paper. San Luis Obispo chapter of the California Native Plant Society.